Gravy is a staple in most households and a must for holidays or other special dinners. Learning how to make homemade gravy is a rite of passage that many girls learn at their mother’s stove. But if that’s something that you missed, it’s time to acquire this vital skill. 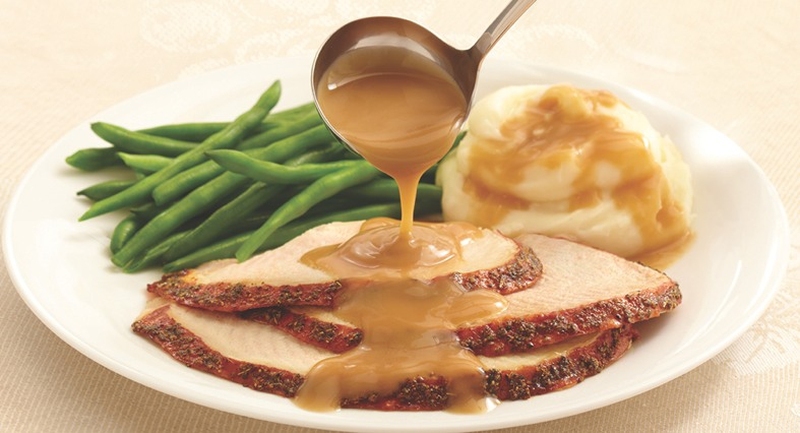 Often, gravy isn’t just limited to the mashed potatoes, but ends up all over your plate. Really good gravy doesn’t come from a little store-bought packet. Those powders are full of additives you can’t even pronounce, much less want in your own kitchen. It’s not hard to learn to make gravy that will enhance your meal rather than ruin it. The best thing about gravy is you don’t need much. Simply a pan, whisk, and measuring cup are enough. If you don’t have a whisk, a wooden spoon will do the trick, you will just need to ‘whisk’ the spoon to keep out the flour lumps. Although you do have to cook the meat (such as roast turkey or chicken) in advance to make use of the pan drippings. However, the following instructions will show a more complicated version which bake the turkey in the oven first and then use the oil. You can opt for simpler ways according to your preferences. 1. After you’ve taken the turkey out of the oven, remove it from the pan. Set the pan on the stove over medium heat. Add a cup of broth to the hot pan drippings and scrape the bottom of the pan well. 2. Pour pan drippings into a measuring cup and set in the refrigerator or freezer for quick chilling. Within about 30 minutes, the drippings and fat will separate and the fat harden, making it easy to skim off the fat. You should have about a cupful of drippings and ¼ cup of fat. If needed, you can adjust amounts by either adding broth to the drippings or oil to the fat, or use less broth later on. 3. Separate the fat from the drippings and put it into a pan, warming it over medium-high heat. 4. When the pan is hot, whisk in the flour to form a thin paste. Cook until bubbly. 5. Add pan drippings and whisk until blended. It will be a thick paste now. 6. Add a half cup of broth, or amount needed to make the right consistency. 7. Add salt and other seasonings to suit your taste. 1. Choose from a variety of fats including canola oil, pan drippings, butter, shortening, or animal fats. Margarine or whipped butters don’t work so well. For cream gravy, butter is the best. 2. You can also use a fat separator to separate the fat from the pan drippings. Deglaze your pan with a small amount of stock, then add it to the liquid you will use in the gravy. 3. The liquid you use will influence the flavor of your gravy. You can choose bullion, stock, potato water (from the potatoes you cooked to mash), broth, or milk. Use the amount of liquid to achieve the desired consistency. Add liquid slowly and stir constantly while cooking. If you get too much liquid, just cook a little longer until the gravy thickens. It will also thicken as it cools. 4. Use milk for a cream gravy, either regular milk or canned milk. For those who don’t use milk, a non-dairy creamer or soy milk will work just as well. 5. Is your gravy lumpy? There are a couple things to try. Use a slotted spoon to mash out the lumps right in the gravy pan. Or pour the gravy through a strainer and mash the lumps as the gravy passes through. 6. Go easy on the seasonings until you taste the gravy. Usually you don’t need extra salt as bullion or broths already have plenty. You can always add more seasonings, but you can’t take them out. 7. Some seasonings to experiment with include onion or garlic powder, sage, dry mustard, poultry seasoning, curry powder, paprika, chives, thyme, rosemary, cayenne pepper, horseradish etc. 8. Try a dash of Worcestershire sauce, or soy sauce for more flavor. 9. Kitchen Bouquet can be added for a richer color. 1. Set a small saucepan on the stove over low heat. Whisk in margarine and flour together. Cook until the flour is golden. 2. Add in water and bouillon, tamari, pepper and thyme. Whisking to keep the mixture smooth and cook until boiling. 3. Lower the heat and simmer for one minute. 4. Add water to cornstarch and stir to avoid lumps. Whisking briskly and pour it into the saucepan. Continue to whisk until the gravy has thickened and boils again.